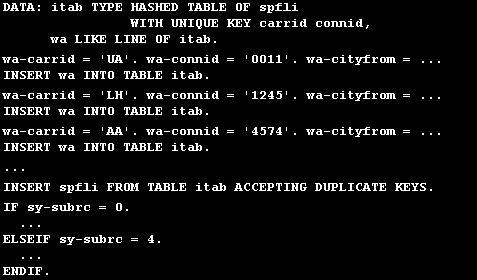 INSERT statement is used for inserting items in Database Tables, Index tables, Internal Tables, Field Groups etc in our ABAP programs. Here we are going to refer about the INSERT statement with tables. For tables INSERT statement will insert new lines in the specified data base tables or internal tables. Now let us check for the syntax and variations. INSERT <dbtab> FROM TABLE <itab> [ACCEPTING DUPLICATE KEYS]. Second INSERT statement will insert the lines from an internal table into the specified database table. ACCEPTING DUPLICATE KEYS addition is used for specifying the duplicate entries are allowed or not. By adding this addition it will add the new entries with the same keys already exist in database table (Duplication allowed). By default duplicate entries will produce a run-time error. We can ignore this by adding this variation. [ASSIGNING <FS> | REFERENCE INTO <dref>]. This statement will insert the lines into an internal table from another internal table. FROM and TO addition will specify the lines to add from the internal table (For example we can specify add the lines from 10th to 20th from an internal table to another internal table).It is an optional one and used for restricting the lines. ASSIGNING and REFERENCE INTO addition is used for assigning the inserted record into a field symbol.